Mortar is a material used in masonry to fill the gaps between blocks in construction. 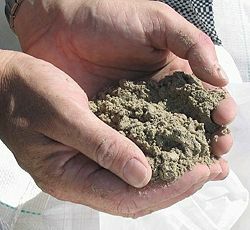 It is a mixture of sand, a binder such as cement or lime, and water. The mixture is applied as a paste that then sets hard. The blocks may consist of stone, brick, concrete, or some other material. The earliest known mortar was used by the ancient Egyptians and was made from the mineral gypsum (calcium sulfate dihydrate). It was essentially a mixture of plaster and sand and was quite soft. The earliest known use of lime mortar dates to about 4000 B.C.E. in ancient Egypt. Lime mortars have been used throughout the world, notably in Roman Empire buildings in Europe and Africa. The vast majority of pre-1900 masonry buildings in Europe and Asia are built using lime mortar. The process of making lime mortar is relatively simple. Limestone is burnt in a kiln to form quicklime (calcium oxide). The quicklime is then slaked (mixed with water) to form slaked lime (calcium hydroxide), in the form of either lime putty or hydrated lime powder. This is then mixed with sand and water to produce the mortar. This type of lime mortar, known as nonhydraulic, sets very slowly through reaction with carbon dioxide in the air. A very thick wall made of lime mortar may take centuries to set and harden completely, but this is normal and not problematic. The speed of setting can be increased by using impure limestones in the kiln to form a hydraulic lime that will set on contact with water. Such a lime must be stored as a dry powder. Alternatively, a pozzolanic material, such as calcined clay or brick dust, may be added to the mortar mix. This will have a similar effect of making the mortar set reasonably quickly by reaction with the water in the mortar. Portland cement mortar (often known simply as cement mortar) is created by mixing Portland cement with sand and water. It was invented in the mid-nineteenth century, as part of scientific efforts to develop stronger mortars than those that existed at the time. Popularized during the nineteenth century, it had superseded lime mortar by 1930 for new construction. Its main advantage is that it sets hard and quickly, allowing a faster pace of construction. As a general rule, Portland cement mortar should not be used for the repair of older buildings constructed with lime mortar. This is because lime mortar is softer than cement mortar, allowing brickwork a certain degree of flexibility to move and adapt to shifting ground or other changing conditions. Cement mortar is harder and allows less flexibility. 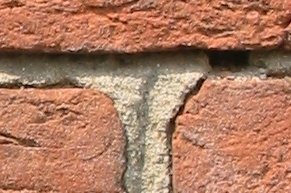 The contrasting properties can cause brickwork to crack where the two mortars are present in a single wall. Portland cement is the most common type of cement in general usage. It is a fine powder, produced by grinding Portland cement clinker (more than 90 percent), a maximum of about five percent gypsum (which controls the set time), and up to five percent minor constituents (as allowed by various standards). The clinker consists mostly of calcium silicates (3CaO.SiO2 and 2CaO.SiO2), the remainder consisting of aluminum and iron-containing clinker phases and other compounds. Portland cement clinker is made by heating an homogeneous mixture of raw materials in a kiln, to a sintering temperature of about 1,450 °C (for modern cements). The major raw material for the clinker-making is limestone (CaCO3). Normally, an impure limestone that contains SiO2 is used. Some of the secondary raw materials used are clay, shale, sand, iron ore, bauxite, fly ash, and slag. Aluminum oxide and iron oxide provide flux and contribute little to the strength. Pozzolana from Bacoli in the Bay of Naples. Pozzolana is a fine, sandy volcanic ash, originally discovered and dug in Italy at Pozzuoli in the region around Vesuvius, but later at a number of other sites. Vitruvius speaks of four types of pozzolana. It is found in all the volcanic areas of Italy in various colors—black, white, gray, and red. Finely ground and mixed with lime, it acts like Portland cement and makes a strong mortar that will also set under water. Pozzolana consists of silica and aluminum oxide, which reacts with calcium hydroxide in the presence of water to form compounds possessing cementitious properties at room temperature. This allowed it to be used in the Roman Empire to make cement by combining with lime and water. Modern pozzolanic cements are a mix of natural or industrial pozzolans and Portland cement. In addition to underwater use, the pozzolana's high acidity makes it especially resistant to common forms of corrosion from sulfates. Once fully hardened, the Portland cement-Pozzolana blend may be stronger than Portland cement due to its lower porosity, which also makes it more resistant to water absorption and spalling. The Roman port at Cosa was built of Pozzolana that was poured underwater, apparently using a long tube to carefully lay it up without allowing sea water to mix with it. The three piers are still visible today, with the underwater portions in generally excellent condition after 2,100 years. ↑ The product of the kiln is called clinker. ↑ As defined by the European Standard EN197.1, Portland cement clinker is a hydraulic material which shall consist of at least two-thirds by mass of calcium silicates (3CaO.SiO2 and 2CaO.SiO2), the remainder consisting of aluminum- and iron-containing clinker phases and other compounds. The ratio of CaO to SiO2 shall not be less than 2.0. The magnesium content (MgO) shall not exceed five percent by mass. (The last two requirements were set out in the German Standard, issued in 1909). McCann, A.M. "The Roman Port of Cosa", (273 B.C.E. ), Scientific American, Ancient Cities, pp. 92-99. 1994.